You heard it right! October 24, we held an RTP180 event at NC State’s Talley Student Union. RTP180: Fake News was an educational evening filled with delicious food and fun raffle prizes. Our five speakers addressed different aspects of fake news, but all finished with a similar takeaway: that humans are the solution to this issue. 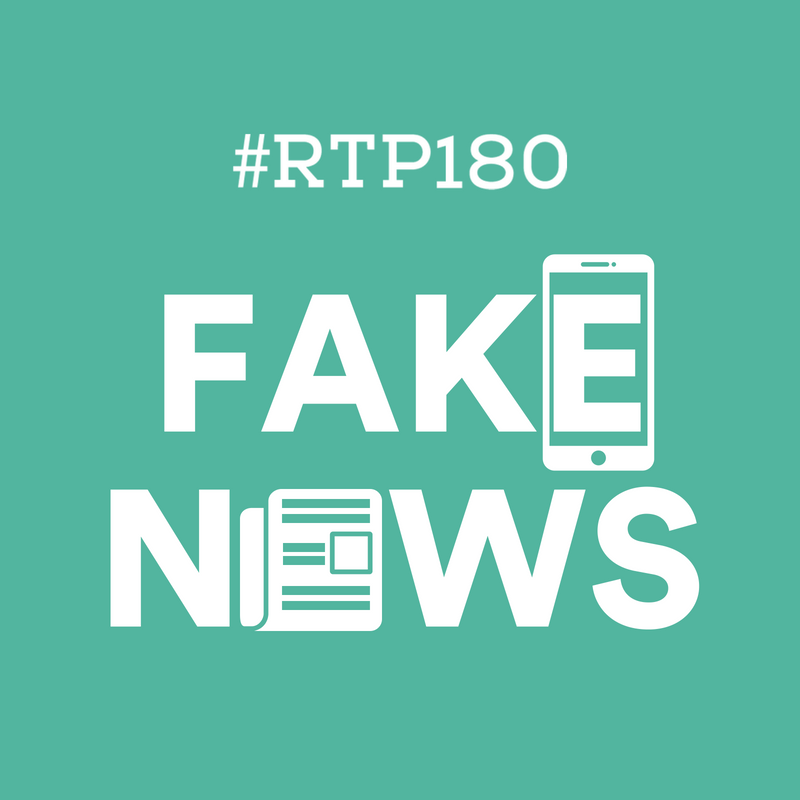 Brian Southwell of RTI International expressed that it is a surreal time for him to be a social scientist studying fake news. 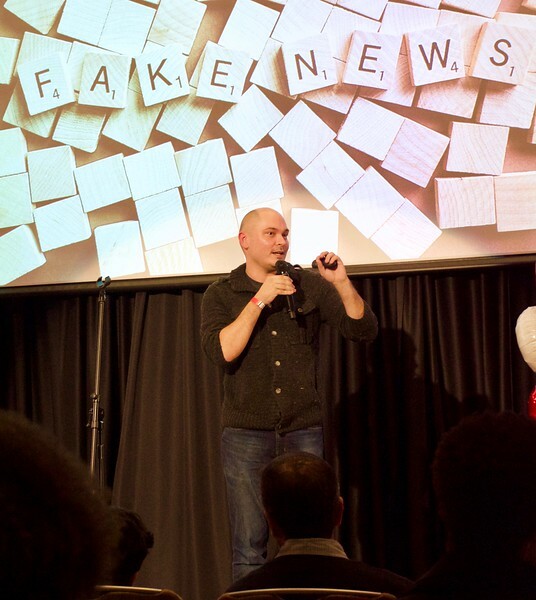 He discussed the reasons why misinformation is an enduring concern—some of which include our human bias towards acceptance and our needs for social bonding over social accuracy. Brian encouraged us to be self-aware of these reasons and take an active role in the solution. Watch Brian’s talk here. 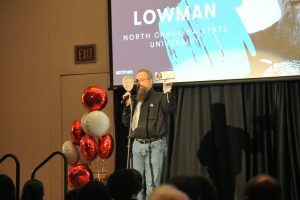 Tim Lowman from NC State University spoke to the dangers of phishing, and dove more specifically into job-phased phishing. He described a situation where someone will begin with an attractive job offer, and eventually delegate tasks that are involved with scams. Tim ended his presentation with the lesson: “If it’s too good to be true, it probably is.” Watch Tim’s talk here. Priya Gandhi from Fidelity Investments touched on artificial intelligence and how technology contributes to the dangers of spreading misinformation. She talked about how video footage or voice recordings can now be altered drastically, making it nearly impossible for the human mind to detect what is real or fake. Priya reminded us not to fear technology, but instead focus on using it for good. Watch Priya’s talk here. Rob Ross from NC LIVE talked about the role of libraries in combating fake news. He shared a poll that indicates librarians are highly trusted, more so than health care providers and government sources. Rob stated that librarians should step up to the important role of helping people recognize the trustworthy sources from the unreliable ones. In other words, some old school practices are still best! Watch Rob’s talk here. 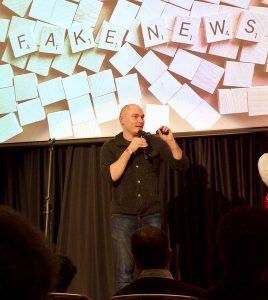 Joseph Cabosky from The University of North Carolina Chapel Hill suggested that the reason people believe fake news is because we simply skim through it. He added that websites know how to format articles to convince readers the information is true, like adding a video clip as validation. Joseph reiterated the importance of checking our bias, no matter how self-aware we may be. Watch Joseph’s talk here. Ready for more #RTP180? Our next topic is Military Tech—reserve your free tickets here for the November 15 event at The Frontier 800 building. Thanks to our presenting sponsor RTI International for enabling us to provide a platform for our community to share their knowledge. We’re also glad to have UNC-TV as our producer—if you can’t make it to an RTP180 event, you can catch the live stream beginning at 6:00PM EST the day of the show at ncchannel.org, and be sure to follow along with us on Twitter using #RTP180.